Set sail on a fearless and fantastical voyage with these playing cards. In their time, no group was feared as much as the Vikings. Now with USPCC-printed cards portraying these ruthless raiders of the sea, you may overpower many during a reign of your own. 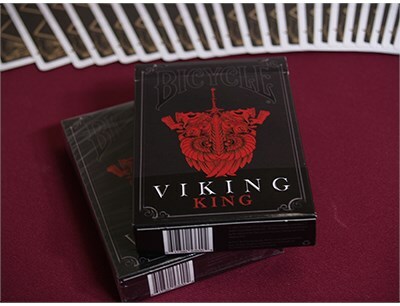 Your opponents will know that you are a true card warrior when they see the Viking King detailed tuck box, and you'll have them shaking in their furry boots. Open the box to unleash the true Norseman or Norse lady (this is an equal opportunity deck) that you really are. This incredible tuck box is hand illustrated, and feature embossed graphics and a die cut window that allows for a glimpse of the cards - in particular a glimpse of the perfectly positioned Viking logo on the back of this deck, which showcase both Odin's twin ravens or Iron Scale's fierce dragons. The face cards possess unsurpassed superior details and rightly portray the king, queen, and jack as the ultimate warriors of the land. Beasts - to include brilliant ravens and scaly dragons - are featured on the aces to assert their own positions in the fierce and mystical world of Vikings. We can't think of a more intense deck of cards to accompany your most teeth-biting, nail-gripping, hair-pulling, gut-wrenching card game! Limited Edition only 1000 printed.